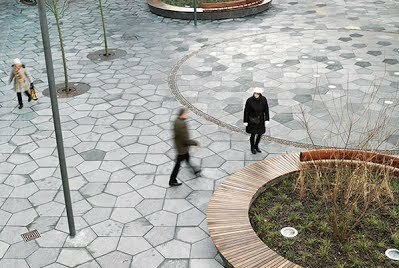 Aside from the use of the Cairo tiling as a paving is its use in other contexts, and here specifically in architecture, of which it also frequently appears, thus giving further credence to its picturesque properties. Indeed, it is to be found worldwide, sometimes mote than once is any one country, in Austria, Australia (2), Belgium, China, Croatia, Denmark, Netherlands, Norway, Japan, Switzerland, and the UK (4). If any reader knows of other instances, I’d be delighted to include them here. A general problem in following up these architecture sightings is that the architects, as a profession, will seemingly not deem to answer perfectly appropriate emails on the building in question. And it’s not just once or twice, but this is the typical response. However, there is indeed the occasional exception here. Indeed, top marks to 3LHD architects, who went out of their way in my request on the Croatia sighting. 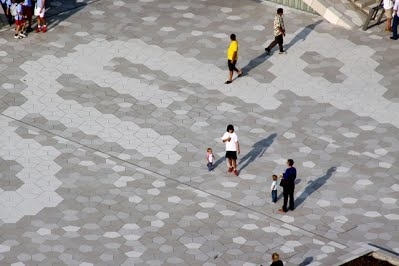 https://www.studio505.com.au/work/project/category/2/commercial/pixel/8.html The Australian Architects ‘Studio505’ in Australia have made use of the Cairo tiling not once but twice, of an upper podium at a mall (completion date not known) in Queen Street, in Brisbane and an office building ‘Pixel’ (completed 2010), in Melbourne. A feature of the Brisbane instance is that of merging the Cairo tiling so that two tiles form a butterfly shape. That of ‘Pixel’ is of a somewhat more distorted use of the tiling. Whether they are familiar with the Cairo tiling is unclear; it is not mentioned at any of the links. The links give numerous pictures. Upon asking with the architects for more detail, twice, I did receive the courtesy of a reply. Subsequently, the business in 2016 effectively closed and separated into two new names. A modern-day instance, of 2017, is to be found at a private house in Hohenems (Austria) by Hoffenscher Architekten, led by Marc Hoffenscher and Günter Rümmele. This is situated in the Vorarlberg region in Austria, reputed worldwide for the vibrancy of its contemporary architecture. The choice of pentagons was not arbitrarily chosen but was rather purposefully selected by the architects, being aware of the Cairo connection. Disappointingly, upon asking for picture permission and more details the architect did not respond, hence the link only. A substantial sighting is at the Ghelamco Arena, home to the Ghent football club, in Belgium. 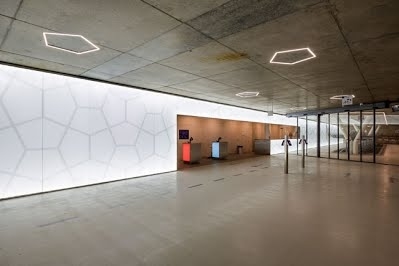 The suspended pentagonal ceiling, installed in 2013, is based on a custom design by Mac Stopa, of Massive Design architects, and is made from acoustic boards manufactured by Ecophon. 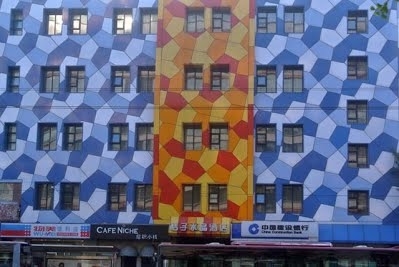 Crystal Orange Hotel, Chongwen Menwai Main Street, Dongcheng District, Beijing 100005, China. A few questions. Does anyone know the background to the Hotel sighting? The pentagons are painted on the exterior. Why is the protruding section painted in orange/yellow? When was this instigated? Of interest is the colouring scheme chosen. As an observation, the colouring (as pointed out by Robert Fathauer) is largely unstructured beyond different shades of blue. 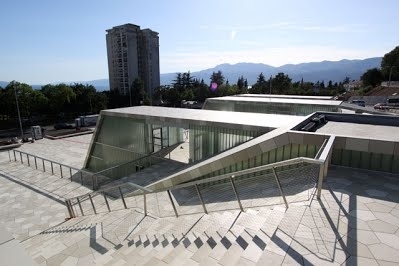 The recently built (in 2009, by 3LHD architects) Zamet centre in Rijeka, an industrial port city in Croatia, is a large, multi-purpose building with a sports hall, local community offices, library, and retail and service spaces, situated at B. Vidas Street. 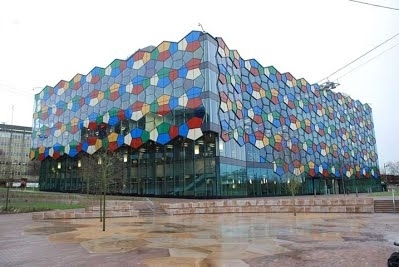 The building has made extensive use of the Cairo tile as decoration for the outside of the building, with 50, 000 ceramic tiles designed and manufactured specially for the centre! As can be seen, the pentagons are coloured so as to resemble aspects of Croatian life. The stripes were inspired by ‘gromača’, rock formations used all over Croatia by farmers to form fields, in two parts; suhozid – a wall made from local stones and dolac, a small field surrounded by the stone walls, which the centre artificially reinterprets by colour and shape to mimic or resemble the contrast between suhozid and dolac in gromača. ‘The task at that time was to design a department store which is located in Omotesando Tokyo, an area which is known for its fashion stores. The reasons why I worked out this pattern are the following. 1. I looked at traditional Japanese prints where a lot of patterns/tessellations are applied. One of the motives is the bellflower which is pentagon based. 2. I came across drawings from Escher where in his Cairo tiling a bellflower like motive can be found. Further does his drawing highly suggest a 3 dimensional weaving of the lines. 3. It is also possible to bend/fold the pattern due to its inherent orthogonal order and utilize it as continuous façade element wrapping around the whole building. In that sense the choice for the pattern is based on a cultural context, a craft like context in terms of textile and weaving and finally the geometric possibilities to utilize it for a façade. Finally changing the thickness of the horizontal hexagons enables a differentiation of window/glazed façade size in relation to the inner functions. This was not done continuously but in seven distinct steps due to the demand of the building industry for standardization. However for the human eye it appears that that there is a gradual change from open to closed. The choice for distinct 7 tiles (it could have been 5 as well) is related to Akira Kurosawa’s movie the seven samurai...in a Japanese societal as well as fashion context it highly questions the notion of individuality since the tiles yet being distinct form a larger structure where their individuality dissolves’. 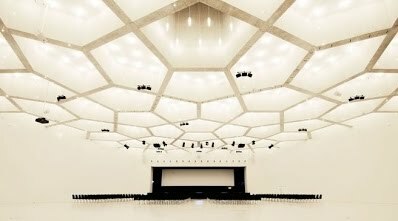 Another recent application, in 2009, is at the well-known Davos Congress Centre (venue for world economic forums), in Klosters, Switzerland, in the heart of the mountains of Graubünden, one of the Alps most modern congress venues. Here, the pentagons adorn the ceiling of the conference hall, an apparent first use as of a ceiling. This was designed by Basel architects Degelo Architects, by Heinrich Degelo. Little, if anything, is known as to the background to this installation. I have no further detail upon this rather matter of fact statement; the architects did not answer my mail asking for more details. Although it’s most unlikely, would any reader have details to add to the above? An interesting sighting of the pentagons is at a mosque. 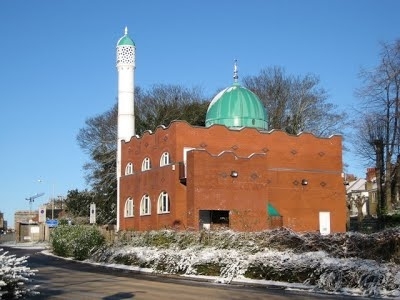 However, this is not in Cairo as might be thought, and indeed it is not even in a ‘traditional’ Muslim country, but is at Watford, in the United Kingdom. More exactly, this is at the Jamia Watford Central (not North Watford) Mosque, 167 North Western Avenue, Watford, Hertfordshire. This was built in 1983 and opened in 1985 . The sighting is interesting in many different ways. Not one but two distinct forms can be seen, both outside and inside the mosque. 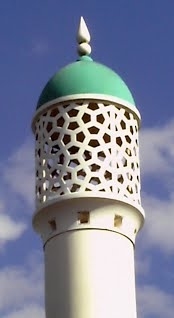 First, as a minaret (pictures are shown below). and second as decoration around the mihrab, or more exactly, as a minor variation of the ‘standard pattern’. Such a sighting of an architecture context therefore at first sight lends credence to Martin Gardner’s enigmatic statement in  to the tiling appearing ‘occasionally on in the mosaics of Moorish buildings’, albeit he cannot possibly be referring to this, given that his article was of 1975, whilst the mosque was built in much later, as detailed above. 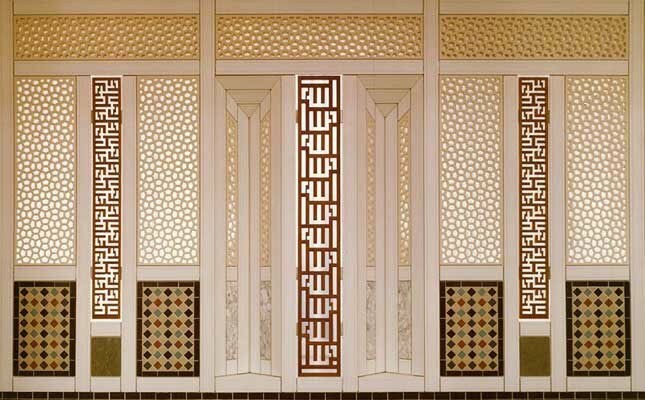 However, this sighting, in conjunction with the Ismaili sighting does indeed imply that it is indeed a ‘traditional Islamic pattern’, although as sure as I can be, the few authors that claim this to be seen (in an architectural context], taking their quotes from Gardner are unaware of these instances. This uncertainty has now been resolved, see . Of interest is the exact geometry of the pentagons; these almost certainly differ. This I qualify by the difficulties of analysis, in that the photos I have of the interior are not altogether satisfactory, as well as the minaret being of a cylinder form, and so analysing from a photo is not ideal. That said, these likely differ. The interior almost certainly consists of the dual of the 32. 4. 3. 4 (with 120° angles) whilst the minaret is possibly (I am less certain here) is of an equilateral pentagon. Below I show a few photographs of both the minaret and interior. Also, accompanying both is an analysis of the tiling, of which the designer has introduced variations to the theme to the interior tiles. 1. Where did the minaret design come from? 2. Where did the interior design come from? 3. Who was responsible for the installation? As ever, if any readers have any additional detail concerning this, no matter how small or minor you may think it may be, I would be delighted to receive details. Note that the Mosque sighting was first added to the Cairo pages per se as a distinct entity that is a dedicated page on 2013, of which upon reflection I have now decided to place on the architecture page, with pictures and text suitably updated. John Sharp, for alerting me to this sighting and for visiting the mosque in person, taking photos and making background enquires, the last unfortunately to no avail. The Ismaili Centre in London, opened in April 1985, is a religious, social, and cultural meeting place for the Ismaili community in the United Kingdom. The Centre is the first religious and cultural centre to be specially designed and built for the Ismaili community in the West. Located in South Kensington, the Centre occupies a prominent site on Cromwell Road, facing the Victoria and Albert Museum. Interestingly, not one but two instances of the Cairo tiling can be seen, although specific detail as to the background is unclear. However, their introduction was seemingly by the German artist and teacher Karl Schlamminger (1935-2017). Muqarnas, left, Panelling on the West window wall of the Prayer Hall, right. Standard practice when creating coloured double glazing units is to apply the colour to surface four – on the inner pane of glass. However, this can reduce the vibrancy of the colour, due to added reflections from the outer pane. In order to create maximum brightness, Pilkington United Kingdom Limited digitally screen printed the colours onto surface two – the inside of the outer sheet of glass. Pilkington Optiwhite, true low-iron glass was used for the outer pane, which has an extremely high level of clarity and therefore allows the colours to be seen in their truest form. 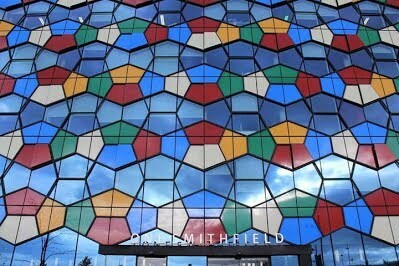 To ensure the colour in the glass panes was completely opaque, a second layer of ceramic paint was applied to the inside of the glass, creating a richly coloured, highly pigmented facade. More detail can be found on the Pilkington link below. 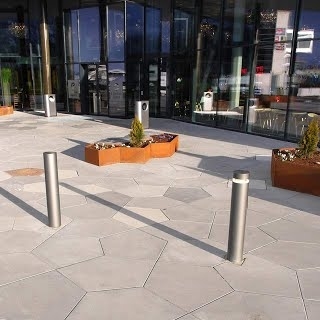 Note also the Cairo tiling outside the building as a paving, almost certainly complimenting this. An open question as to whether the architects were indeed familiar with the Cairo tiling or not, and if there was some reason for the choosing of such a pentagonal design. Upon inquiring with Aedeas, I did not receive the courtesy of a reply, although Tom Kendrew, associated with the project when with RHWL, did at least answer my mail. Certainly, this sighting has been extensively discussed in architectural journals, newspapers, web and a Pilkington news release, but even so, nowhere is made mention of the possible Cairo tiling connection. The question is thus left still unresolved. 22 June. Revised 12 July 2013 Japan. Omotesando complex added. 9 February. Switzerland, Davos Congress centre added. 13 August. 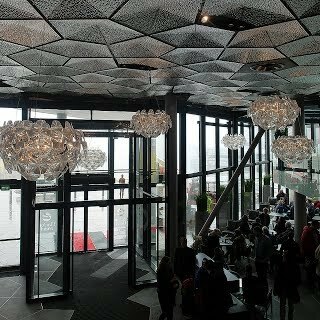 Norway, Tromso, The Edge hotel added. 13 October. 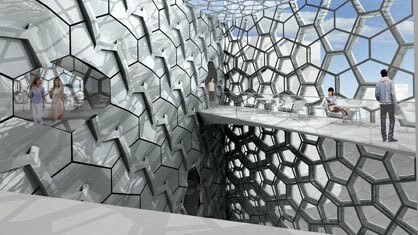 China, Robert Fathauer's Crystal Hotel in China pictures added, replacing earlier instances of 2015. 16 October. United Kingdom, Watford Mosque added, moved and added from a dedicated page of 2013. 19 October. Belgium, Ghalamco Arena added. 8 June. Austria, house in Hohenems added. 12 June. 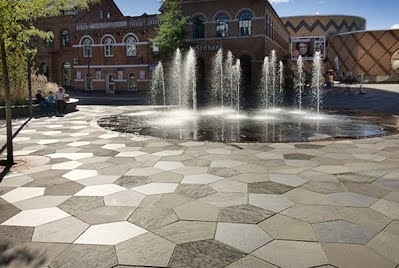 Denmark, Hørsholm town centre paving added. 7 August. Netherlands, Strawinskylaan bycle park added. 12 March. UK. One Smithfield building text and imagery added. 15 March. Australia. Studio505 text added.